Contact lenses are an alternative chosen by most women to help the eyes see better than glasses. Not only that, small objects are placed right on the black of this eye also plays a role in the perfection of appearance, especially with the various colors available. However, do you know if using indiscriminate softlens can trigger the occurrence of conjunctivitis? For those of you who do not know what conjunctivitis is, here are the reviews. Often called a belekan, conjunctivitis is a health disorder that attacks the eyes. The disease is characterized by the appearance of dirt on the eyes in large quantities and followed by the change in the white color of the eyes to red. 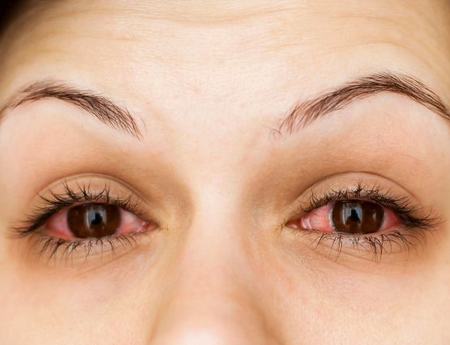 In acute conditions, conjunctivitis will make the eyes water and swell up to be difficult to open. In fact, conjunctivitis occurs because the conjunctiva or the lining of the eye has an infection or inflammation. This condition makes the blood vessels look more clear, so the eyes become red. Of the many health problems that occur in the eye, conjunctivitis is the most common, even the transmission of this disease occurs very quickly. Although rarely encountered, it turns out conjunctivitis can occur due to allergies. In this condition, usually only one eye will have an infection. Things that become allergens that trigger the occurrence of conjunctivitis is the oak tree. Conjunctivitis caused by viral or bacterial infection has a very high transmission risk. This transmission occurs because the physical contact of people with other people. Therefore, people with conjunctivitis are advised not to move and interact with many people when the infection is severe. In addition to allergies and infections, the occurrence of conjunctivitis can also be caused by the entry of foreign objects into the eye, such as when you use softlens carelessly, especially if the contact lenses are in a dirty state. Improper use is what causes eye infection. Eyes irritated and changed redness suddenly. Appears a sense of pain around the eyes or in the inside of the eye. In order for conjunctivitis does not occur in your eyes, do the following tips to prevent it. Wearing indiscriminate softlens followed by unsanitary contact lenses is a major cause of conjunctivitis. Therefore, make sure the contact lenses you want to use in a clean and read the rules and how to use it carefully. Eye infections can be prevented even if you use contact lenses, provided you understand well the health condition of your eyes. That way, you can find the appropriate type of contact lenses. Before going to sleep, make sure you have removed the softlens you use. Sleeping in the eyes still wear contact lenses can trigger the movement of germs in the eyes that can cause the occurrence of infection. Always ask the doctor when is the right time to change contact lenses and duration of use. You can ask directly through Halodoc application that you have downloaded through App Store or Google Play Store. This will help reduce the risk of conjunctivitis when you wear contact lenses. Halodoc application can also be used to buy drugs without having to leave the house, you know!